Você acha que a sua língua determina a forma com que você pensa e lida com as coisas? No vídeo que estou compartilhando com vocês hoje, Rosana Hermann, que é jornalista, escritora, blogueira, bacharelada em Física e tantas outras coisas, fala sobre o efeito que a nossa língua tem sobre a forma com que nós pensamos. Na lógica dela, que aliás vai de acordo com desde linguistas renomados até meros curiosos das línguas como eu, as diversas línguas fazem as pessoas reagirem e encararem as mesmas situações do dia a dia de maneira diferente. A língua dos chineses, por exemplo, que é expressada através de ideogramas, faz com que eles pensem duma maneira muito mais simbólica e romântica, e aí por diante. A palestra é dada na língua portuguesa e não é focada na língua inglesa, mas mesmo assim interessa a qualquer estudante de Inglês por nos fazer refletir sobre as diferenças que nós temos que lidar e nos acostumar todos os dias entre a nossa língua materna e a língua alvo. Enjoy the video! All the expressions we're touching on today have some kind of influence from biblical quotations. Everybody knows how applicable Bible can still be today even though so much time's separated us from the day it was written. For example, the Bible teaches us how to act generous for simply being right and not because you expect a reward. Suppose you're a jack of all trades [a person able to do a variety of jobs acceptably well], and whenever your neighbors need a little help with a leaky shed or a faulty gate, you make no excuses before giving them a little hand without expecting anything in exchange. 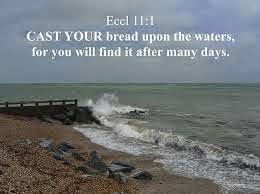 When people wanna talk about you on that sense, they say you cast your bread upon the waters. That's a proverb from the Bible you can still use today like any other modern expression. It refers to that very honorable action of giving without expecting. Let's move on to our second biblical expression with the word cast. Suppose you're a very considerate person who's always trying to give your friends and family the best of you. One day you find out one of your very close relatives is in need of good advice and there you go again feeling like it's your place to help him out. After many pieces of advice, you realize he's not taken any of your words and that makes you very frustrated. When a friend of yours sees how frustrated you are, he tells you: Giving him advice is just casting pearls before swine. He doesn't listen. Can you understand that expression? When you cast pearls before swine, you waste something good on someone that doesn't care. 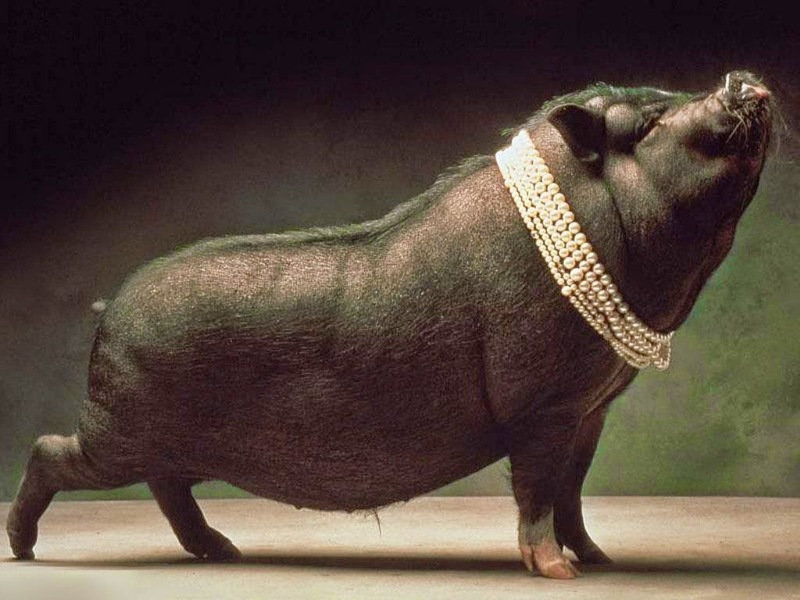 Just imagine how much of a waste it would be to literally cast pearls before swine. And finally our third and last expression: to cast the first stone. You must have heard of this one. We say it all the time in Portuguese. To cast means to throw something. 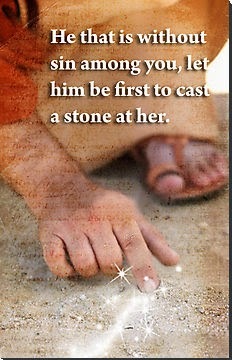 So in what situation would you tell someone not to cast/throw the first stone? That's right: when you don't want them to make the first criticism, to be the first to attack. So imagine you did something wrong and people are about to judge you. Before they do though, as an attempt to get away with your mistake, you say: Alright, cast the first stone if you've never done something wrong before. Jesus once said that to teach people only those who are faultless have the right to pass judgment upon others, implying that no one's faultless and therefore has no right to judge. That's it for today guys. Talk to you next time! 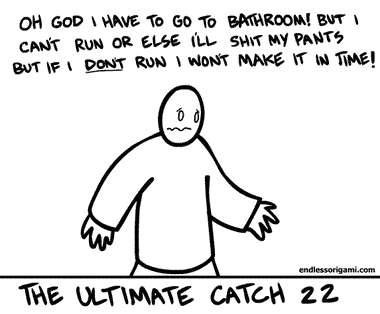 O que significa catch-22 ou catch-22 situation? How many times you find yourself struggling to find the right word to best describe a certain tricky situation in your life? Truth is, sometimes there's no such word in the language and you have to find different words to put it in a way so people can understand you. For example, sometimes we get ourselves in situations where one thing must happen in order to cause another thing to happen, but because the first thing does not happen the second thing can't happen. Did you know there's a specific word that can perfectly describe that kind of thing? Keep reading and you'll understand what I'm talking about. Many people graduate from college thinking that will be it for them to finally get a bit of a kick start in life. The problem is that we all know that's not always how things work in the market place. There's a vicious circle that always pulls the rug from under people's feet. That is, in order to get a job you need experience, but to acquire experience you need to get a job in the first place. That's what in English we call a catch-22 situation, or simply a catch-22. When you're in a catch-22 situation like that, you're not really taking control of things. It's the rules or conditions that create such a situation and make a victim out of you. Do you want another example? Read on! You really want to start your own business to make more money, but then you realize you need to have money to make more money. You can say you're caught in a catch-22 situation too. In formal language, we can call that a paradoxical situation because you can't escape the contradictory rules. That's it for today guys. Take care! Como dizer cheiroso em Inglês? Ainda me lembro que no começo dos estudos de Inglês fiquei intrigado ao tentar traduzir literalmente a palavra cheiroso do Português para o Inglês. Quando eu falo literalmente, eu quero dizer que eu estava tentando encontrar um adjetivo correspondente ideal para esse que nós usamos na nossa língua. A verdade é que eu já sabia como passar a ideia de que alguém ou alguma coisa cheira bem, mas por que de repente chamá-la pelo adjetivo cheiroso em Inglês parecia ser tão desafiador? Continue lendo e você descobrirá! Se você ousou simplesmente colocar a palavra cheiroso no tradutor, acabou levando um baita de um susto. A palavra que ele sugere é odoriferous. Que tipo de palavra é essa? Que tipo de contexto tão técnico e formal nós deveríamos estar para usar essa palavra sem despertar estranhamentos? Bom, eu não faço ideia. O fato é que existem algumas maneiras alternativas de se dizer que alguém cheira bem sem propriamente usar um adjetivo em Inglês. A mais popular delas é "you smell great! ", "those people that just walked by me smell wonderful!". A verdade é que essa expressão é muito mais comum de se ouvir do que qualquer outra coisa que eu venha comentar aqui. Mas atenção para uma observação: a expressão deve ser sempre constituída pelas suas três partes... pronome + smell + advérbio/adjetivo, como nas expressões que você acabou de ver [apesar do uso do adjetivo ser gramaticalmente incorreta neste caso, é muito comum encontrar pessoas dizendo algo como "you smell so good".] Se você disser simplesmente "you smell", o significado assume o sentido contrário. Você está dizendo que a pessoa ou alguma coisa fede. Your shoes smell; your hair smells; that man smells, that place smells. Todos esses exemplos assumem o significado negativo da expressão. Mas depois dessa falatória toda, você ainda quer saber como dizer o adjetivo cheiroso em Inglês. Infelizmente, não existe uma correspondente comumente usada que equivalha exatamente a palavra cheiroso em Inglês. O que existe na verdade é o que chamamos na gramática inglesa de compound adjectives, ou adjetivos compostos. Esses são adjetivos diferentes que contém duas ou mais palavras que se juntam para passar a mesma ideia. Chamar uma mulher em Inglês de "a mulher mais cheirosa do mundo, por exemplo, seria "the best smelling woman in the world". 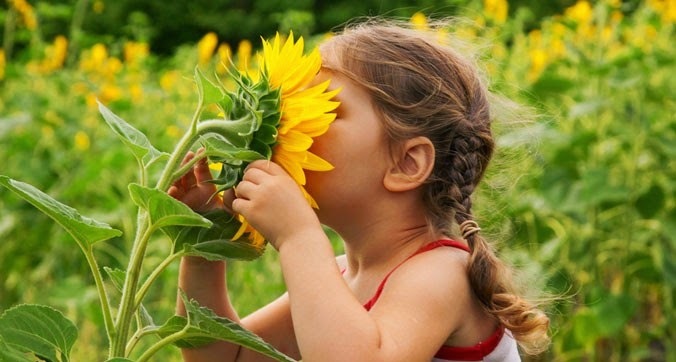 O adjetivo que nos interessa aí é "good smelling". Finalmente achamos algo que se aproxime da palavra cheiroso em Inglês. Vamos praticá-lo: a good smelling person; a good smelling girl; I can't resist good smelling women; They told me I'm a good smelling man. Isso é tudo por hoje pessoal. See you next time! Have you ever heard of the word gear before? If not, let's learn its meaning first and only then we'll be talking about the expressions. If you can drive a car, you're pretty much used to that word in your language. In Portuguese, that word means, among many other things, marcha. So if you want to say, for example, dar marcha ré in English, "to engage reverse gear" is the correct way. The same logic applies to the other gears, like to engage the first gear, the second gear and so on and so forth. We could go over many other combinations with the word gear in its literal meaning, but this post aims at bringing you some new expressions with it. So without further ado, let's learn them! I was watching an american talk show one day and after a long time discussing a single topic, the host was desperate to move on to a different topic, so she said: Let's shift gears now and talk about something else. But what does she mean by shift gears? You usually say that when you suddenly change what you're doing or what you're talking about. Imagine yourself hanging out with a friend of yours in your place. You guys have been listening to rock and roll all day long and then you feel like shifting gears and listening to blues. As you must have figured, shifting gears is nothing but a break from what you've been doing in a little while. That expression is based on the idea that a vehicle will change speed when you change gears. Now suppose you're one of those people who need a little time every morning to make yourself start thinking clearly and effectively. Better yet, suppose you spent the whole night out partying and drinking a lot and now are having the world's worst hangover. The problem is that you just got a call from your boss telling you about this last-minute meeting you're supposed to attend in less than an hour. He tells you over the phone: if you don't get your arse in gear you'll be late for this meeting. Bot wait, what does that mean? If you try to get your arse in gear, you force yourself to start working or to hurry. There are actually many ways to say that. If you're having a hard time trying to stay focused, you might be told to get your brain into gears or simply get into gears. If you're in the middle of your day struggling to keep yourself awake and then you take some coffee that finally wakes you up, you can say after drinking coffee you've swung into high gear. That means you've begun operating at a fast pace and increased the rate of activity. That's it for today guys. Take care! O que me encorajou a criar esse post foi justamente o fato de eu estar há uma semana tentando andar de patins. Enquanto conversava com um americano sobre isso, várias expressões e palavras relacionadas aos patins surgiram, assim como muitas dúvidas também. A dúvida mais básica de todas é: como dizer andar de patins em Inglês? Isso é bem simples. A expressão é to roller skate. Então imagine que você está conversando com alguém em inglês e quer perguntar se a outra pessoa sabe andar de patins. 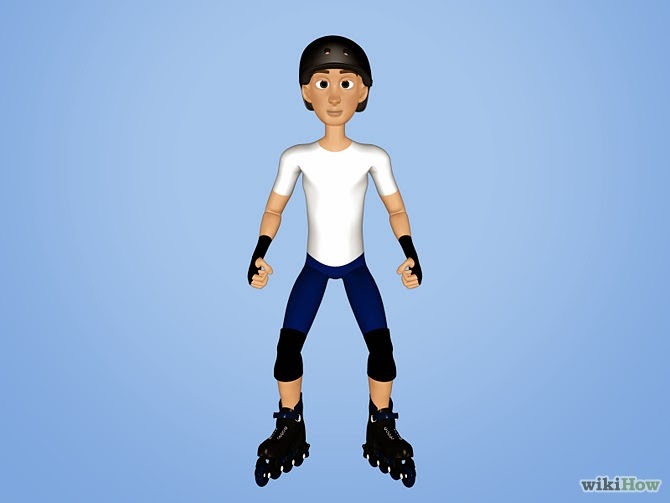 Você pode dizer: Can you roller skate? Se a resposta for sim, talvez você queira convidá-lo para andar de patins algum dia contigo. Então você diz: Do you want to go roller skating with me tonight?, ou simplesmente "We should roller skate together sometime, what do you think? Vamos conhecer outras expressões relacionadas. Imagina que você está aprendendo a andar de patins e, portanto, precisa de alguém te dando instruções sobre como se portar em cima deles. Em algum momento, essa pessoa pode te dizer algo como: stand with your feet shoulder width apart. Será que você conseguiria entender essa instrução? Isso significa ficar de pé com os pés separados paralelamente aos seus ombros. Isso faz sentido na hora de andar de patins e praticar vários outros esportes já que isso proporciona melhor equilíbio [se você ainda não entendeu a postura direiro, apenas dê uma olhada na figura acima]. Além de fazer esse movimento, você também precisará dobrar os joelhos, que em Inglês é to bend your knees, além de se acocorar para alcançar maiores velocidades, que é to squat. Ah, sem esquecer de manter sempre o equilíbrio/to keep your balance. That stance will prevent you from toppling over [essa postura vai te empedir de tropeçar]. Os principais equipamentos para andar de patins com segurança são capacete/helmet, joelheiras/knee pads, protetores de pulso/wrist guards e, claro, um par de patins/a pair of skates. Por hoje isso é tudo pessoal. Leave your questions on the comment section below. Take care! 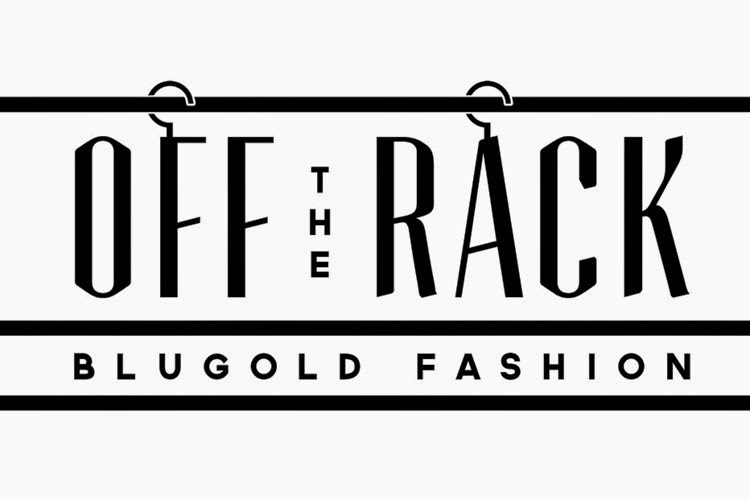 Você sabe o que off the rack significa? Since Friends is one of the sitcoms I watch the most [even having its last episode shot a lot of years ago], that's where i get most of my expressions from. This time, I was watching the episode 7 from the second season and here's the situation: bride-to-be Monica is in the middle of a meltdown after finding out her parents had spent all the money for her wedding. A wedding party seems to be one of her greatest priorities at the moment and now her friends are trying to calm her down by saying things like "it will be fine", "you don't have to have this rustic Italian feast". Among the many things they said as an attempt to make her calm, one of them caught my attention. Rachel said: You can still wear off the rack. Do you have any idea of what that means? When you wear off the rack, or wear off-the rack clothes, you wear clothes that are marketed in a finished condition in standard sizes, clothes you literally take off from racks at a store. If you don't know what racks are, they're those objects you use to hang your clothes on. Stores use them to stack in their clothes so they'll be more organized and easier to find. So now you understand Monica's dilemma? She would have to wear a ready-made wedding dress that anyone else could get, not an exclusive dress made to her size and style. Rachel said it would not be a big deal to wear off the rack, but she didn't mean it. She also thought that was like reaching rock bottom. But what do you think? Do you see any problem in wearing off-the rack clothes? For our first expression with the word behind, picture yourself in this situation: you're in the middle of a very challenging project and afraid there won't be enough time for you to finish it on time. You're so desperate to make it you go on into the late night working extra hours with no set time to end. To make matters worse, you find yourself having the hardest time with your boss calling you every 2 hours asking if it's done. The last time he called you up, he said: You have to hurry and finish soon or we'll fall behind schedule. Do you understand what to fall behind schedule means? Let's see. When you fall behind schedule or when something you're working on is behind schedule, it means you have failed to do something by the appointed time. Moving on to our second expression, now we have something we may be very used to in our own language. That's because we say it the same way. If I asked you how you'd say "fazer algo com as mãos atadas" in English, you'd be very likely to be successful with your translation even if you attempted to translate the expression word by word. Just look at the way we say it in English and you'll see what I'm talking about: to do something with one hand tied behind your back". Very intuitive, huh? As far the meaning of the expression, you must have realized we say that expression when we make someone believe we're capable of doing something very easily. That's actually an expression you use when you're showing off your skills. For example, you're with your cousin playing video games when he starts bragging about the last game he beat. That's when you say: Come on! I can play that game with my hands tied behind my back! That's it for today guys. Take care!